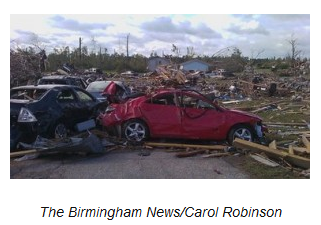 You Can Help The Alabama Tornado Victims! You are here: Home / Great Deals / You Can Help The Alabama Tornado Victims! My friend Kristin, of Couponing To Disney, lives in Alabama and her home and family narrowly escaped damage from the tornadoes and storms the last few days! Well, you can help the people of that area! This is a great place to donate your stockpile overage – we all have stuff that we need to donate and here is your opportunity! One of the tornadoes touched down just blocks from her house! Thank God, they are safe! If you would like to send a monetary donation, please memo your check: Disaster Relief. The Red Cross is taking text donations. Just text text REDCROSS to 90999 to donate $10. Please be generous and donate. Then kiss and hug your family tonight and thank God they are safe! Thank you for your help!